Sounds great and speakers are fine. I used it in a smaller 5.1 set up for music and movies. It may be mounted vertically or horizontally, and it's suitable for any left, center, right or surround channel. The Titanium cones with rubber surrounds can handle plenty of bass for an extended listening session, such as a house party, without producing significant distortion. This speaker is timbre-matched to all other Blue Octave speakers for seamless integration with other models. All weather design. Designed and Engineered in the USA! When you're listening to music that really resonates with you, the quality of what you hear is just as important as what you are hearing, and the Resonance Series were designed with this in mind. Form Factor: Center Channel. Series S-Center. Does not apply. Connectivity: Wired. You will receivePremier Acoustic PA-8c Center Channel Speaker-cherry - EACH. BOSE VCS-10 Center Channel Speaker . Condition is Used. It all adds up to 150 watts power handling and precise, powerful sound across the entire audible spectrum. The digitally tuned bass reflex enclosure fights internal vibrations that can compromise performance and a black ash wood veneer finish gives this speaker a warm, refined look, making it an attractive addition to just about any room.
' ---In-Wall / In-Ceiling System ---Includes (2) 5.25'' High-Power Long Throw Woofers ---Center / Left / Right Channel System ---300 Watts Rated Peak Power ---1'' High Temperature Voice Coil ---1'' Titanium Dome Tweeter ---Electronic Crossover Network ---Variable Boost ( 7-3dB) ---Frequency Response 70Hz-22kHz ---8 Ohm Impedance ---Mounts Flush on Walls or Ceilings ---Perfect for Custom Installations & Applications ---Includes Cut-Out Template for Easy Installation ---Video Shielded for Near Screen/Monitor Applications ---Vented Design for High Power and Deep Base Response ---Overall Dimensions: 7 2/5''(H) x 15 1/5''(W) x 3 3/5''(D) ---Cut-Out Dimensions: 6 2/5''(H) x 13 4/5''(W) x 3''(D) ---Sold as: Unit ---Weight: 6.09 lbs. Up for sale is the USED Bose VCS-10 Center channel speaker. Movie of unit available upon request. 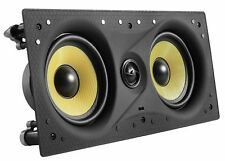 2 Way --1.25" Tweeter (9950-C15)-- 2 x 7" Mid-Bass (8836AC2). Weight : 48.5lbs Each. Crossover frequencies: 2.95 kHz. Power handling: 100watts. Up for sale is a Bose VCS-10 Center Speaker. Works great. Condition is Used. 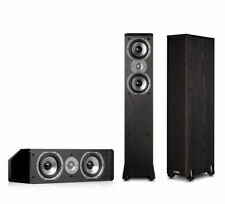 Sale includes center speaker only. Nothing else. What you see is what you get. Trending at $79.47eBay determines this price through a machine learned model of the product's sale prices within the last 90 days. For center speakers wired in the ceiling. 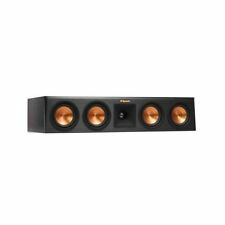 Sapphire SC center channel speaker for home theater. Excellent, like new condition - no flaws on cabinet or grill. I am the original owner. Black woodgrain finish. Two 5.25" midrange and one 1" tweeter. Mirage center channel AVS-100. Condition is Used. Shipped with USPS Priority Mail. Speaker work great and sounds even better. In like new condition. Awesome speaker. Check my other listing for similar items. I also have the subwoofer that goes with this. Polk CSi30 Center Channel Speaker. Polk Center channel is excellent condition. Enjoy a dynamic home Audio experience with Meidong sound bar. Experience High-Resolution Audio from 3-way speakers and 4 separate amplifiers with this slim sound bar.The sleek profile and modern design makes it a great match for any thin-profile HDTV. The 2.0 Channel System delivers rich, crystal-clear sounds to enhance any movie, music or gaming experience. New, totally sealed, never opened box. This JBL speaker designed for center channel use is made in USA, and is identified only as CENTER model. To allow you to confirm a good physical fit for space near your TV, it m easures 18 1/2" long, 6 1/2 high, and 5 3/4" deep.
. As seen in pictures. TESTED-works JBL Northridge J Center Center Speaker 8 Ohm Made In USA. Condition is Used but I’m really good shape. Shipped with USPS Priority Mail. No Accessories, Only 1 speaker is Included. The center is funded solely by the sale of donated goods. We promise to resolve problems quickly and professionally. We will do our best to provide you the information you are looking for. Hex screws are used throughout for assembly. Versatile and affordable hearing is believing. Place the MB42-C directly above or below the TV and tilt it towards the listener for best results. They can also be used vertically in a pair as bookshelf speakers. New ListingJBL Northridge Series N-Center Channel Speaker Tested and Working Great Sound! Condition is Used-works great. Characteristics include 150-watt power handling, 8-ohm impedance, 90 dB sensitivity, and 75 to 20,000 Hz frequency response. JBL's N-Center model loudspeaker features a dark gray finish. 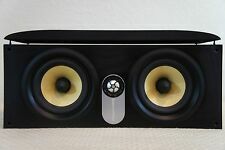 5 out of 5 stars - JBL Northridge Series N-Center Channel Speaker Tested and Working Great Sound! 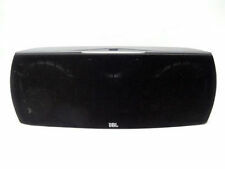 1 product rating1 product ratings - JBL Northridge Series N-Center Channel Speaker Tested and Working Great Sound! JBL Northridge Series N-Center Channel Speaker Tested and Working Great Sound!